Elk Mountain Ranch Co., LLC is pleased to offer all-natural, grass-fed BISON for sale to those seeking a premium quality, healthy supply of meat! Ø Elk Mountain Cull Cows cost $825 each. Average weight exceeds 930 pounds. We will select one for you and deliver it to our local processor, where you will pick up the meat after it is cut. You pay the processing costs. Ø Elk Mountain 18-Month-Old Heifers also cost $825. 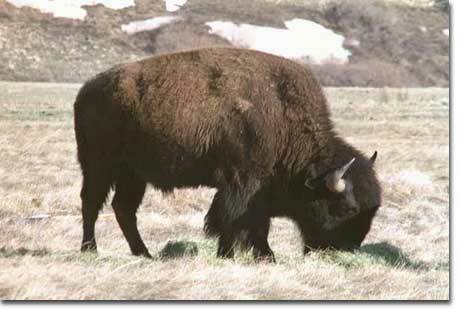 These animals average over 600 pounds, and are the highest quality and most tender bison available. We will select, harvest and deliver to our processor for your cutting instructions, and on your account. If you wish to shoot your own bison, there is an additional $75 charge and you must take the dressed animal with you. Please call (307) 348-7447. We will be happy to talk with you about our bison and answer any questions you may have. All sales are first-come, first-served, and must be booked and scheduled by telephone at (307) 348-7447.